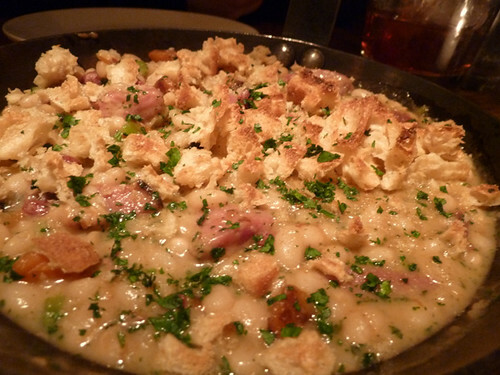 Totally with you on the root problem with cassoulet at many restaurants: apparently rushed. As with confit (which frequently seems to suffer from same cause), I’d rather make it at home and enjoy it more. 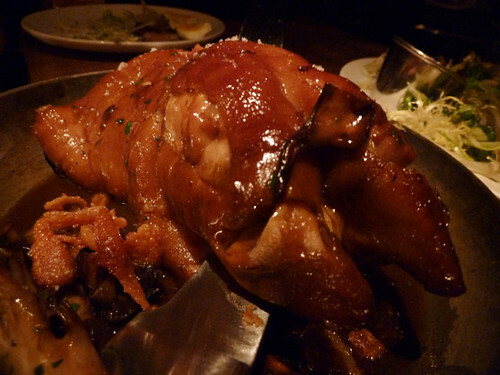 Hate the trotter or love it as much as I did, I don’t think the characterization as American gastropub porcine excess is right. Versions of this dish have long studded the menus of fine dining establishments in France (there are similar versions in Italy too), and the particular version on which Maude’s is based comes from a famous Pierre Koffman restaurant in London. It’s a dish that gets talked about a lot in top culinary schools, because there’s a lot of technical skill required to get it right. I’ve never had any of the iconic versions, but what I tasted at Maude’s matched exactly what I had in mind based on what Koffman fans and culinary school instructors describe. 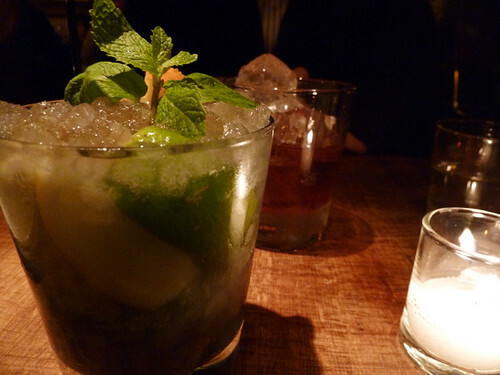 The wobbly and soft texture sounds off-putting, but I thought it was a revelation – unlike anything else I’d ever tasted, and highly enjoyable. Maybe it had an off night, but for us it was immensely greasy and there was an unpleasant flavor when the mushrooms were eaten with the sauce. I’m sure it wasn’t helped by arriving when we were basically stuffed ourselves, but really, “unpleasant” and “gross” was the reaction we both had. And even if it’s authentic to a certain style of French cooking, it felt like a representative of the let’s-overdo-pork school of Chicago 2011 menu composition. I think you’re spot on with most things (in relation to my few experiences) and surprised you even ventured into trotter land. I’m always leary of specials on menus for the exact reason that it’s not a strong suit. It’s unfortunate you didn’t get to enjoy the more traditional and delicious parts of the menu like sausage of the day, shortrib, market fish or any raw bar items. I still haven’t even tried the cassoulet because I enjoy everything else too much. Anyway if you could still have a positive experience with a goofy dish and a decent cassoulet, I bet your return would be that much better. Well, people on LTH, like KennyF, had raved about the trotter, but it just didn’t happen for me. 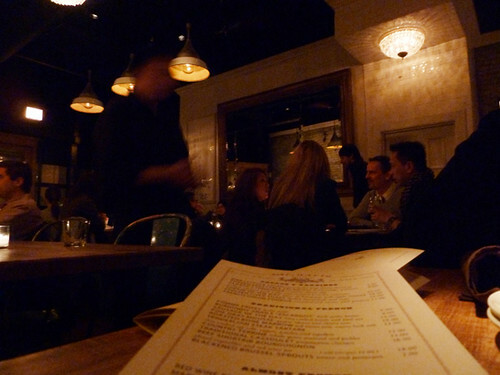 I was Mr. Gebert’s dining companion that evening and given more time to reflect, I’m even less positive about my meal than I was when I was leaving the restaurant (especially now that I’ve had more time to look at my credit card bill). Very little worked for me at Maude’s especially at the prices they’re charging. The cassoulet was a $16 bowl of thick bean soup with a few hunks of meat in it, astounding similar in flavor to something I made at home the prior weekend. The trotter was just a disaster. And Mike is dead on about the Lyonnaise salad. This did not need a re-working. It’s annoying to have giant slabs of pork on top of your frisse when you really want smaller lardons. The egg should be poached, not soft-boiled, with a nice runny yolk. Again, I think this salad was $12 which I feel is about 30% too much. I liked the fries a lot, but I probably won’t return to Maude’s. When it really comes down to it, if you add a few bucks to the price of the fries, I can go to the Hopleaf and get a big pot of mussles AND fries AND bread and enjoy it significantly more. This is the 3rd or 4th new restaurant in Chicago in the past year that the whole world is raving about that I had a negative reaction to. Perhaps I’m being extra grumpy lately or I’m just out of step with what’s good and exciting these days, but I think I need to take a break from restaurants that put out press releases.